Outlandish Observations: Finished the series...again! Last day of filming for OUTLANDER Season 4! I finished listening to the audiobook of Diana Gabaldon's WRITTEN IN MY OWN HEART'S BLOOD last night, wrapping up my latest "re-listen" of the OUTLANDER series. This is approximately my 20th time through the OUTLANDER books since November 2006. I mostly listen to the audiobooks rather than reading print or e-book editions, because the audio versions force you to really slow down and pay attention to the details. I pick up new little details on every re-listen. And besides, Davina Porter is a wonderful narrator! She does a terrific job with all the voices and accents. It takes me a long time to get through the whole series, but this last re-listen took much longer than usual. Looking through my iTunes library, I see that I started listening to OUTLANDER on August 4, 2016, so it's taken me almost exactly two years. I took a long break from late August-November 2016 (my dad passed away in September of that year), and again in the fall of 2017 while Season 3 was in progress, but otherwise I maintained my habit of listening for 30 minutes to an hour most days. 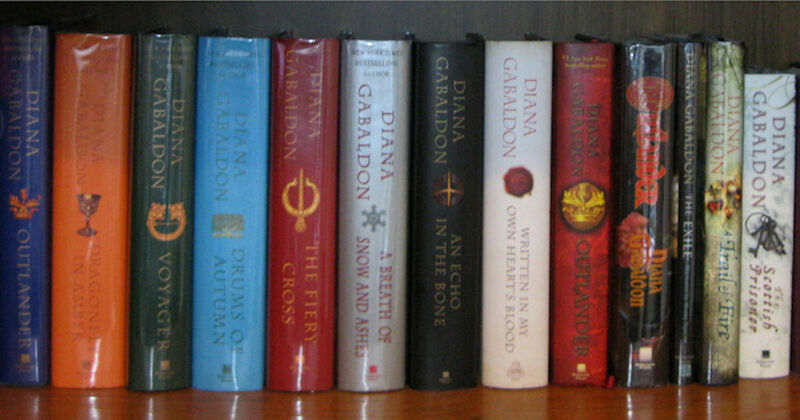 In between the Big Books, I also listened to THE SCOTTISH PRISONER and all of the stories in SEVEN STONES TO STAND OR FALL. That's at least 400 hours of listening, spread over two years. I will probably take another break from the audiobooks before I start over again with OUTLANDER. I always need some time to decompress after I finish the series. What about the rest of you? Any other audiobook-addicts or compulsive re-readers of the OUTLANDER books out there? In June I decided to reread Outlander because it had been awhile, at least a year. Of course I couldn't stop there, so immediately read DIA and Voyager. Finished Voyager last week and am taking a short break to read a few other books that I need to review for NetGalley, then will read DIA. Will probably read a book or two in between each of the books from here on out, just to keep my reviewing up to date! But yes, I keep them in my reading rotation! My husband just finished reading them for his first time through...next for him is The Scottish Prisoner! I've listened to all of the books at least twice and will probably start over again before the next book comes out. I agree with all of you; Davina Porter does a wonderful job narrating. I listen to audio books on CD all the time--I get them from my local library. I have CD players in the kitchen, bedroom, a portable one to take to volunteer jobs, and there is a CD player in my car. I am just now finishing The Word is Murder by Anthony Horowitz. I usually listen to mysteries and thrillers--anything that I would be tempted to read the last page first! I can't really do that with the CDs. I have read the complete series twice, and listened to every audio book (including the Lord John) last year. I just finished reading/rereading the short stories. I am now watching the series, I'm on season 2 right now, to prepare for the return of the series in November. Yeah, I re-read the Outlander books, and usually include Scottish Prisoner & any of the other novellas. On my last re-read I added whichever Lord John book (BOTB?) that has Percy in it since he has now shown up in MOHB.... Besides Outlander, the only books I ever re-read are Brandon Sanderson's books in the Cosmere, which is what I'm currently going back through right now. As soon as a date for BEES is announced, I'll probably take a Cosmere break and do another Outlander re-read. I too only do the audiobooks, but have a paperback of MOHB by my bed that I like to pick up and read at random places.